The Galilee Basin is an onshore basin located in central Queensland and covers an area of ~247,000 km2. It lies adjacent to two major producing basins in the Bowen and Cooper basins. The Galilee Basin is prospective with 107 deep exploration wells drilled since the 1950s. No economic discoveries have been made to date from this limited exploration, however, numerous oil and gas shows have been encountered. 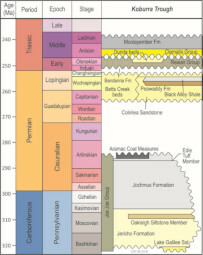 These shows, including in the Lake Galilee Sandstone, are an indication that an active petroleum system exists. The basin is near the proposed extension of Jemena’s Northern Gas Pipeline from Mt Isa to Roma as well as the recently sanctioned Adani coal mine, which will require gas to power its operations. Vintage Energy signed a farm-in agreement with Comet Ridge Ltd to earn a 30% staged interest in the Sandstone reservoir sequence of the Galilee Basin permits ATP 743, ATP 744 and ATP 1015. The joint venture is focused on the ‘Deeps Area’ within each of the Petroleum blocks, which is defined as including all strata commencing underneath the Permian coals (Betts Creek Beds or Aramac coals) with the main target being the Lake Galilee Sandstone sequence. The high quality technical and commercial work undertaken by Comet Ridge has highlighted the potential of this largely ignored Galilee Basin sandstone conventional gas target. Gas has already been discovered in the Galilee Basin and, with future appraisal success, the basin could quickly become a significant contributor to the East coast gas market. Vintage, through a two-stage farm-in, has earned a 15% interest in the Deeps (sandstone targets) within ATPs 743P, 744P and 1015P and is earning a further 15% by paying 50% of the cost of the Koburra 2D seismic survey and the drilling of Albany-2 and Albany-1/STI, up to a cap of $10m (gross). Comet Ridge will continue to hold a 100% equity interest in the “Shallows” (the coal targets that generally range from approximately 600 metres down to 1,100 metres). Full details of the farm-in conditions and stages are provided in the ASX release dated 1 November 2017. The area is lightly explored with little seismic and only 3 wells drilled within the permits. 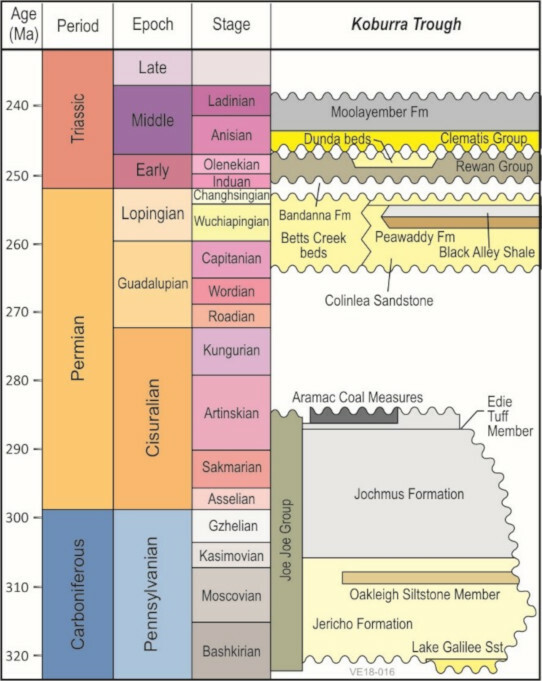 However, the Lake Galilee Sandstone sequence has flowed gas to surface from Lake Galilee-1 (1964) and Carmichael-1 (1995), which were drilled targeting oil. 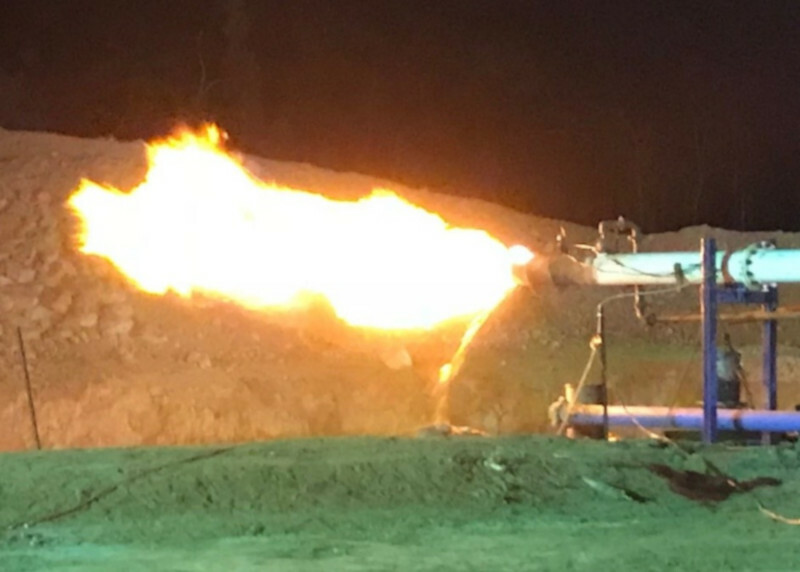 The application of the latest technology and the utilisation of air/nitrogen drilling has already resulted in successful flow of gas to surface through Albany-1. Carmichael-1 is considered to have made a gas discovery and Contingent Resources for the underlying large 61 km2 Albany structure has been booked by Comet Ridge. It has recently been assessed by independent experts to contain a conventional gas Contingent Resource as shown in Table 1. Via the farm-in process, Vintage will earn its proportional share of these Contingent Resources for the Albany structure. *COI ASX announcement 5 August 2015, ATP 744, independent resource certification, Carmichael Structure. The Contingent Resources for the Albany (Carmichael) structure referred to in Table 1 are taken from an independent report by Dr. Bruce McConachie of SRK Consulting (Australasia) Pty Ltd, originally released to the market in Comet Ridge’s announcement of 5 August 2015. Estimates are in accordance with the Petroleum Resources Management System (PRMS) (SPE, 2007) and Guidelines for Application of the PRMS (SPE, 2011). Probabilistic methods were used. Following the drilling of the Albany-1 well, SRK is of the view that the measured gas flow rate endorses their previous estimate of the range of Contingent Resources. The key to unlocking this valuable resource is obtaining a commercial flow rate. The staged work program was designed to address this issue on the Albany structure and further define other opportunities around the permits. The program commenced in May 2018 with the drilling of one conventional gas appraisal well (Albany-1) on the Albany structure, close to where the Carmichael-1 well flowed gas in 1995. The well was designed so that the prospective section would be drilled with air/nitrogen rather than conventional drilling mud, to enhance the potential flow rate from the sandstone. Vintage funded the first $3.35 million of this stage (Stage 1a) to earn a 15% interest in the Deeps across the three Galilee permits. The well was drilled to a depth of 2,595 mKB and penetrated 13 metres of the “B” sand which flowed gas continuously for 23 hours. The flow was diverted to the testing equipment where a stabilised rate of 230,000 scf/day was measured over a period of 1.5 hours through a 1¼” orifice plate, with no formation water recovered. Due to mechanical difficulties, the well was suspended pending further evaluation stages. 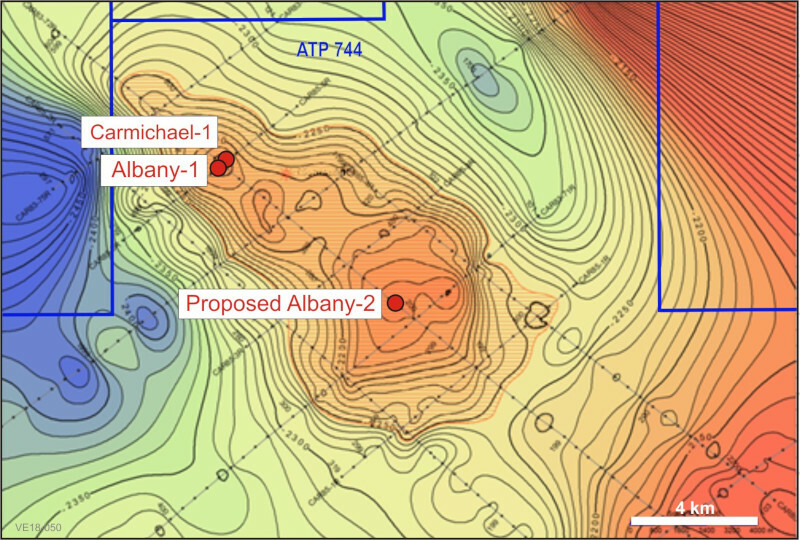 “The joint venture is now actively planning the location of the step-out Albany-2 well …”. Vintage and Comet Ridge have now both formally committed to Stage 2 of the farm-in process, whereby Vintage will earn an additional 15% interest in the GBDJV, taking its equity to 30%. Stage 2 work that has been agreed includes the recently completed 336 kilometre 2D seismic survey, the drilling of Albany-2 and the deepening of Albany-1. 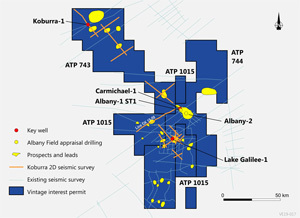 On 30 December 2018, Stage 2 of the farm-in commenced with the 336 kilometre Koburra 2D seismic program across permits ATP 743, ATP 744 and ATP 1015. The seismic program focused on two main outcomes. The first is to mature Lake Galilee sandstone leads and prospects to drillable status and the second is to define the highly prospective regional structural trends with multi-level targets. We anticipate that the data generated by the Koburra 2D seismic program will be processed and ready for interpretation in Q4 FY19. The processing will be undertaken alongside the reprocessing of 619 kilometres of pre-existing 2D seismic data. Ensign rig 932 has been contracted to drill both Albany-1/ST1 and Albany-2. The rig is expected to depart Moomba for the Galilee Basin by the end of April 2019. The agreement signed with Ensign is for two firm wells plus two contingent wells with the contingent wells are dependent upon evaluation of the Koburra 2D seismic program. Ensign rig 932 is a 1,000 horse-power rig which is a significantly larger and more powerful rig than previously used to drill Albany-1. The rig will deliver increased drilling rates and reduce trip times when changing drill bits and other components on the drill pipe. Vintage is looking forward to working with Comet Ridge to help discover, appraise and develop commercial volumes of gas to help ease the stress within the East Coast gas market. A successful outcome will provide commercial opportunities for development of the asset via supply of gas to potential local consumers, such as adjacent coal mines and provide an impetus for connecting the Galilee Basin into the Eastern Australia gas pipeline network.